"If there's a song in your heart, willing and eager to start, then you'll belong where that song means the most, and can make you the Toast of New Orleans." The sound of the voice singing these words made me bolt upright in my chair! I had not heard that voice in many years, but a flood of memories came back to me in a flash. I was once again a nine-year-old in a movie theater. On the large screen was the most handsome man I had ever seen singing to me! And, oh, what a voice! It came out and filled the whole space around me. I was transfixed by the sight and sound and remained that way until the lights came on, breaking the spell. However, it is obvious that spell has never been broken. I think the unexpected shock of instant recognition gave me cause to wonder what it is about this voice that makes it so different from any other to me. 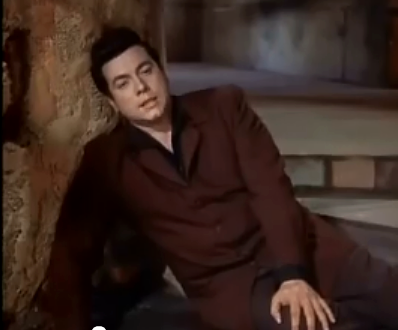 Of course, the owner of the voice was Mario Lanza! From that moment on, I felt compelled to gather all the recorded music I could find by him. Luckily much of his music was now available on CD and I bought everything I could find. Soon it became evident that I had lost my initial one-sided taste for songs like Be My Love and The Loveliest Night of the Year. I discovered Mario's talent was multilateral. His masterful renditions encompassed many distinct genres of music. So excited was I by this realization that I was determined to examine as many examples as I could in the categories of opera, Italian songs, love songs, inspirational songs, and operetta. To merely state that his was an incredible voice with the ability to induce total involvement of the listener does not do him justice. Therefore, I would like to take one song/aria from each of the genres and interpret my feelings. Perhaps the piece that moves me the most is Mario's rendition of the Otello Monologue, so I shall begin in the operatic area. If I were granted only four minutes of film on Mario to keep forever, I would choose his Otello Monologue from the film Serenade. To me it is the most perfect representation of what Mario would have been like on the opera stage. It is a precious gift from him to us. In it he conveys what total commitment he was capable of having to operatic material. To say that he had an affinity for the role of Otello would be an understatement. His voice had matured enough by this time to match his understanding of the Moor. At this point in the opera, Otello's mind had been sufficiently poisoned by the malicious Iago that he was suffering pure torment. We see the deterioration of a once powerful ruler as he is brought down to a wretched mass of humanity. Mario's performance shows this with heart wrenching accuracy. He incorporates hand gestures, facial expressions, and body language along with his incredible voice in such unison that we don't even notice that he is not in costume!! His perfect diction and flawless lip-synching add to the impeccable picture of a natural operatic performer. Again I have to use the word 'perfection'! At the beginning of the aria, Verdi's swirling music sets the scene for the mental anguish we are about to experience. What we see as Mario begins, "Dio, mi potevi scagliar tutti i mali, della miseria - della vergogna…"
(God! Had you flung onto me all the torments of misery - of shame…), is a grief-stricken man expressing the extreme pain and suffering he is going through. He tells of how he could accept having all his worldly trophies taken from him if it was the will of Heaven. However, his very reason for living, (Desdemona), has seemingly transferred her affections to Cassio and he has no hope of any future happiness. The light has been taken out of his life and he is desolate. He now has no option left but to make her confess her crime and then take her life! Mario's depiction of Otello's rising rage is truly a sight to behold. His eyes flash, he assumes a menacing stance facing directly into the camera, his hands gesture as though he is wrapping them around her neck and he cries out, "Confession! Confession!" We gasp as his terror goes straight into our hearts! At Iago's announcement that Cassio has arrived, he then exclaims, "La? Cielo! O gioia!!" Mario's face as he looks up to the sky is priceless and this image is one we shall always remember. He has given his all….